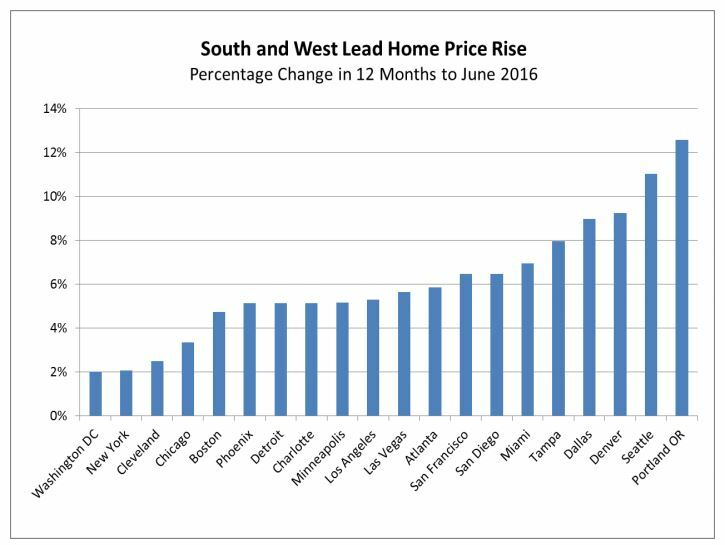 Case-Shiller home price data for the past 12 months shows San Diego in the middle of the pack. Home prices continued to rise in San Diego and across that nation in June, but the pace is slowing locally, according to the most widely watched real estate index. The influential Case-Shiller index released Tuesday showed home prices rose 0.2 percent in San Diego in June, down from the 0.9 percent increase in May. “In a handful of areas, including pricier markets like San Diego, inventory is starting to creep back up,” noted Dr. Svenja Gudell, chief economist for the online real estate firm Zillow. Prices have risen 6.4 percent in San Diego over the past year, well above the national average of 5.1 percent, but below the double-digit increases in cities like Portland and Seattle. Blitzer said sales of existing homes are at running at about 5.5 million units annually with inventory levels under five months, while sales of new single-family homes are at the highest rate since November 2007.